Dressed in his polka dot shirt and armed with his matching strat, the blues legend and long-time Ernie Ball player Buddy Guy hit the Jimmy Kimmel Live! stage this past week alongside Billy Cox and the Experience Hendrix Band. The amazing experience ripped through a version of Jimi Hendrix’s classic “Red House” in support of a recently issued Hendrix compilation LP, Both Sides of the Sky. Buddy Guy plays Power Slinky strings. 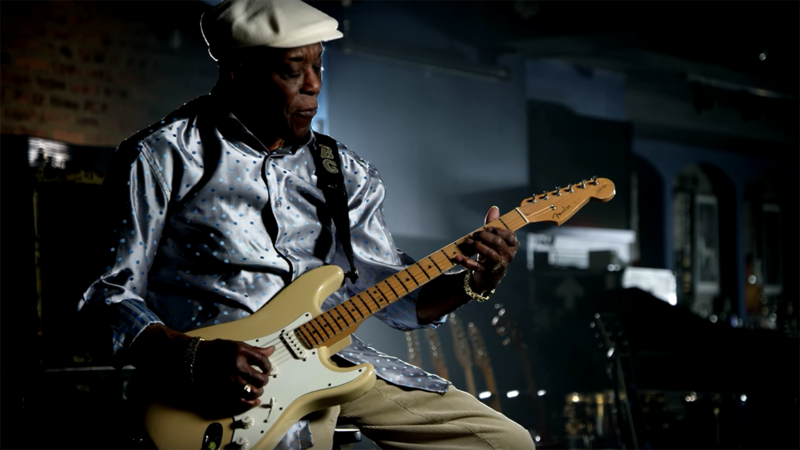 Buddy Guy was featured in our series Pursuit Of Tone. Check out the trailer for the film below. In Los Angeles, CA at the Hi Hat, Rivers Cuomo performed a very intimate concert performing crowd-favorite Weezer hits. Rivers also included covers, “Champagne Supernova” from Oasis, “Today” by The Smashing Pumpkins, and “Losing My Religion,” between anecdotes and inside jokes. Check out Rivers’ acoustic performance of “El Scorcho” from Pinkerton and make sure to catch the “Weezer Concert” line in the second verse. Nashville indie rockers Moon Taxi said hello to Jimmy Kimmel Live! this week to perform a few tracks off of their 2018 release, Let the Record Play. Plaything through their feel good track “Two High” and ballad style four to the floor tune, “Not Too Late,” Moon Taxi brought some great guitar work to the inside stage at Kimmel. Moon Taxi plays Power Slinky, Super Slinky and Regular Slinky Bass Strings. Armed with some new tunes from their recently released album, Tearing at the Seams, Nathaniel Ratliff & The Night Sweats visited Jimmy Fallon this past week to perform their track, “You Worry Me.” Check out the smooth rolling performance below. The band is currently on a massive European, UK and North American Tour in support of their new album which you can pick up here. NRNS plays Power Slinky Electric Strings and Earthwood Phosphor Bronze Medium Acoustic Strings. Have you ever heard A-ha’s tune “Take On Me” fingerstyle? Well thanks to Alexandr Misko, you now have the opportunity. Alexandr has been making a name for himself in the finger style world with his innovative real-time string tuning, thumping and strumming to do all sorts of amazing covers and original pieces. Check out the video below and explore his other videos via YouTube. We promise you, your ears will be pleased. Alexandr plays Aluminum Bronze Medium strings. Jakob Danger-Armstrong (Billy Joe Armstrong’s youngest son), Chris Malaspina, Enzo Malaspina, and Kevin Judd are a force to be reckoned with. The Oakland based punk band Mt. Eddy took over the Alternative Press Instagram and released back to back music videos for their new, 3 track, self titled EP. Jakobs’ unique vocals and the band’s catchy riffs will be sure to have you hooked and dancing whether it’s at a “Sweet Sixteen” or to “Robert Smith”. Check out both music videos below and the new music streaming on Spotify. The Irish powerhouse Flogging Molly released a new music video for a previously unreleased track titled, “Going Home” from Flogging Molly’s Life Is Good sessions. The song touches on all the finer points of completing a long journey and that clear moment of self realization that you are returning home. Check out the video below. 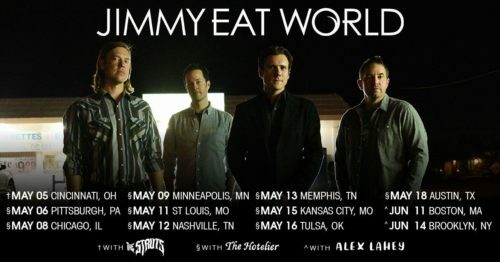 Longtime Ernie Ball players and recent String Theory partakers, Jimmy Eat World, just announced a string of dates starting this May. The shows will take the band throughout the midwest and over to the east coast with support by none other than Ernie Ball artists, The Struts, The Hotelier, Rozwell Kid, and Alex Lahey. Check out the dates below and watch Jim Adkins in his newly released String Theory episode. Jimmy Eat World plays Nickel Medium and Power Slinky electric guitar strings, Earthwood 80/20 Medium Acoustic strings and custom .055-.125 Nickel Bass strings. Here’s a fun one! MXPX frontman and longtime Ernie Ball friend, Mike Herrera will be featured on HGTV’s hit show “Fixer Upper.” No performance here, but Mike and his wife will be making the move from Washington to Texas and Chip and Jo (of the tv show) will be helping them find their home. Check out the special “Rock Star Renovation” episode airing on HGTV on April 3rd at 9pm. See more details here. Mike Herrera is also a String Theory Alum. You can watch his episode below.